Salmon skin has a rubbery texture, so people prefer to leave it behind on their plate rather than eat it. We know that fish contains a lot of healthy fats, but what we may not be aware of is that most of the fats are stored within its skin. But, can you eat salmon skin? Is salmon skin healthy for you? Eating salmon skin is as healthy as eating the fish itself. However, since the skin tastes unpleasant and is rubbery and moist, you have to cook it the right way to enjoy this delicacy. But, is salmon skin edible? Let’s look at its nutrition facts. Fish are exposed to toxins and pollutants in the ocean. If the fish feed on creatures in contaminated water, the toxins get absorbed into the fatty tissues of their bodies. The reason why the skin is removed is to reduce heavy metal exposure, as well as the risk of consuming toxins. So, can you eat salmon skin? Absolutely. However, you should opt for wild-caught salmon as it has fewer toxins than farmed salmon. Avoid eating farmed salmon as the chances of contamination in farmed salmon are greater. As mentioned, salmon skin may taste unpleasant if not prepared properly. It may take some time for you to get used to its flavor of the skin, but adding it to your diet certainly has health benefits. But, is salmon skin fattening? Most of the healthy fats in the fish are present in the skin. So, you shouldn’t skin the fish before serving it. Eating the salmon skin boosts your omega-3 fatty acid intake. Also, leaving the skin on during the cooking process makes it act as an insulator between the flesh and the heat. The skin of poached or steamed salmon turns flaccid and rubbery. Meanwhile, grilling the salmon gives the skin a crispy texture. The fat in the skin makes it flavorful and crispy upon cooking. In fact, most sushi restaurants use the skin in sushi rolls. Salmon skin is high in proteins and low in carbs. One serving of salmon skin contains six grams of proteins. It has good amounts of phosphorus and potassium, as well as traces of other essential minerals. It also has vitamins B and D.
One serving of salmon skin contains around 107 calories. Salmon skin is high in calories and can increase your daily calorie intake if consumed in excess. So, however healthy the skin is, moderation is key. 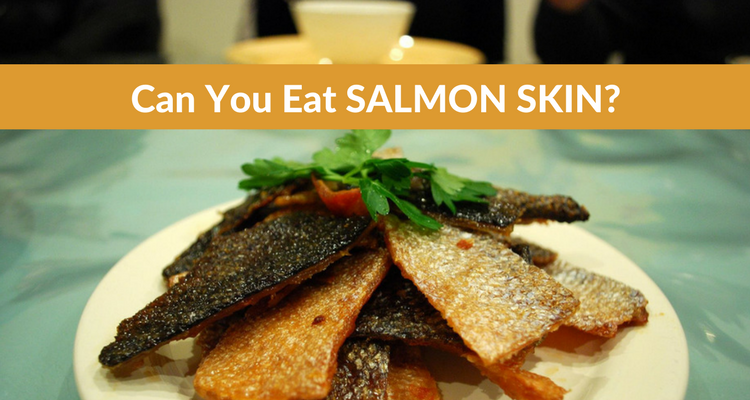 Now that you know you can eat salmon skin, let’s look at three benefits of eating salmon skin. The omega-3 fatty acids in the skin help prevent heart attacks. They optimize brain function and have anti-inflammatory properties. Consuming omega-3 for a longer duration may also prevent Alzheimer’s and Parkinson’s disease. Regular consumption of salmon skin prevents osteoporosis. According to a study published by the Ohio State University, women who consumed the recommended daily amount of omega-3 showed a decline in hip fractures. The high amount of vitamin D in salmon can increase your vitamin D to the recommended levels. Vitamin D deficiency can cause cancer, multiple sclerosis, and arthritis. It is essential for bone health. How to Clean Salmon Skin? Is it necessary to clean the salmon skin? Can you eat salmon skin with scales? Scaling the fish is important to avoid the scales from cutting your mouth or getting stuck in the throat. Scraping the salmon scales can be a tedious task unless you know some simple tricks. Let’s see the proper way to clean salmon skin. Place the fish on top of the sink. Spread a newspaper on the surface so that you don’t make a mess everywhere. You can remove the scales with a fish scaler which you can buy at most kitchen utility stores. You can also use the blunt side of your knife to scrape off the skin, applying only a little pressure. Ensure that you gently run the knife along the skin. Brush the salmon to remove the remaining scales and wash it. Pat the salmon dry with a paper towel. To remove the skin, use a sharp knife. You can use a filet knife to remove the skin and start from the tail. At the tail side, make a slit on the skin and then pull the skin outward. Doing this will allow you to remove the skin easily from the flesh. Here are two salmon skin recipes which can help you savor it better. Remove the skin from the salmon. With the scale side down, put the skin on a large cutting board. Scrape off the flesh from the skin with a spoon. There should be no flesh, only thin skin. Spread a half tablespoon of the sesame oil on a heat-proof baking dish. Cut the skin in half and place it on the baking dish with the scale side down. The skin should be placed completely flat on the dish. Rub the sauces onto the skin and sprinkle the sesame seeds over it. Cover the baking dish with an aluminum foil. Do not tuck it in. Bake at 200°C for 25 to 30 minutes. After 30 minutes the skin should be crisp and not oily or soft. If it’s not crispy, bake for another five to 10 minutes. Keep on checking the skin during this time as it may burn. Once the skin is dry and crispy, allow it to cool. The skin should be able to stand when held vertically. Slice the salmon skin into quarter-inch thick strips. Put them skin into a bowl and toss with two tablespoons of kosher salt. Pat the salmon skin dry with a paper towel and set aside. Add enough oil in a frying pan or a wok to fry the salmon. Add the salmon skin and fry over medium-low heat. The skin can take around 10 to 15 minutes to turn crispy. Drain on a paper towel. Serve with sauce. If you want a Spanish flavor, use olive oil for frying. Sprinkle smoked paprika before serving. To conclude, yes, you can eat salmon skin. Salmon skin is healthy but is also high in fat and calories, so you should avoid having large portions. Also, you should choose the right salmon to get maximum benefits. Farmed salmon may be cost-effective, but it is deficient in nutrients compared to wild-caught salmon. Also, the risk of contamination and heavy metals is greater in farmed salmon than wild. So, get some wild-caught salmon and enjoy its skin with the easy and quick salmon skin recipes we provided. “Health Benefits of Salmon Skin,” The Luxury Spot, June 2, 2015; http://www.theluxuryspot.com/health-benefits-of-salmon-skin/. “Baked Salmon Skin,” CaféSigrun, November 10, 2009; http://cafesigrun.co.uk/baked-salmon-skin.